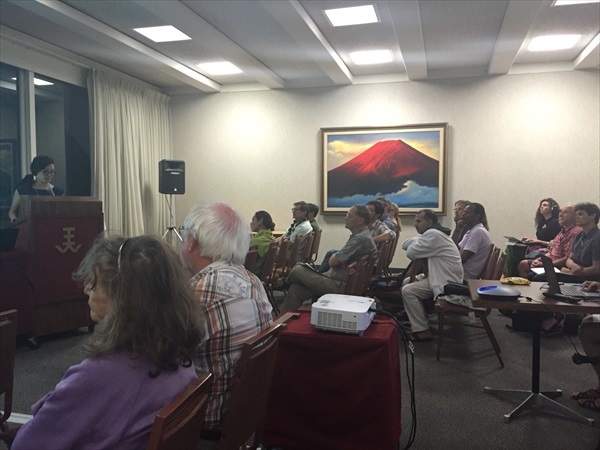 The Town Hall on March 6, 2017 was an opportunity to provide early input to the 4th National Climate Assessment (NCA4) development process about how climate change affects different sectors, livelihoods, and ecosystems in Hawai‘i and the Pacific Islands. This document comes out every four years and is mandated by law. Science and new data are being generated all of the time, so sharing the climate risks and adaptations at a national and region level is critical to informing policy makers, resource managers, stakeholders & community members all across our nation. Regional engagements with stakeholders like this event are central to the production of the NCA, so it was great to see about 50 community members of varying ages, backgrounds & perspectives show up and call in . The atmosphere at the East-West Center’s Imin International Conference Center remained calm and the conversations productive. Our region, Hawai’i and the U.S. Affiliated Pacific, reaches as far West as the Republic of Palau, nearly 4,500 miles SW from Honolulu where the Town Hall took place. Let me put this into perspective, Honolulu is nearly 4,826 miles SW from Washington D.C. With time differences across this geography it can be difficult to communicate, let alone participate in person. 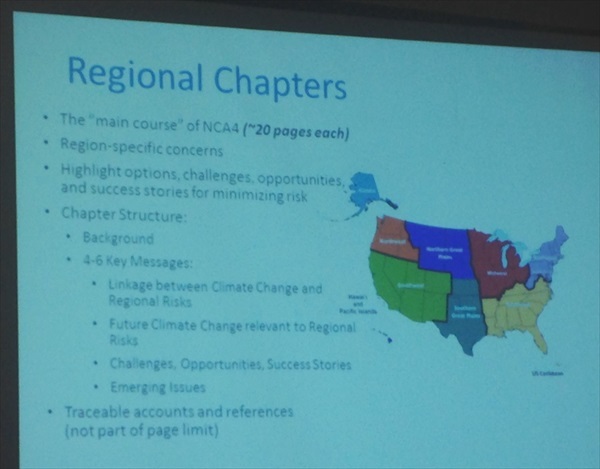 However for a Monday night, there was a buzz in the air and participants eager to engage with the authors of our regional chapter and give input to this process. Dr. Victoria Keener, the lead author for the Hawai’i and Pacific Islands Chapter of the NCA4, facilitated the conversations throughout the night. We heard opening remarks from the East-West Center President, Dr. Richard Vuylsteke who reminded us that our nation is adjusting to new administration and our involvement now, more than ever, is critical on a multitude of levels. Following that warm welcome, we heard the inspiring words from Kalisi Mausio, who shared her experience on the Hōkῡle’a and the mission of the Mālama Honua Worldwide Voyage. She reminded us that traditional ecological knowledge and the wisdom of our kupuna are just as important to this work here and all around the world. We transitioned to Dr. Fred Lipschultz of the U.S. 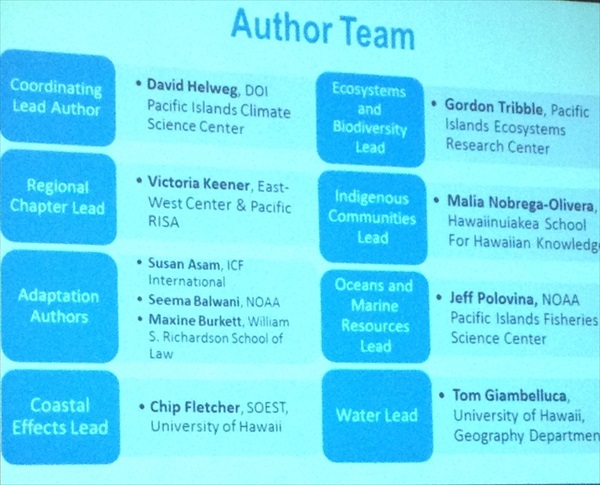 Global Change Research Program who made us all giggle by sharing the scientific name of one of the diatoms in Kalisi’s slides and his early research & time here in Hawaii. He eloquently highlighted some of the changes we might expect to see in the 2018 NCA4 & emphasized that this version is intended to build upon the successes and address some gaps of the NCA3. 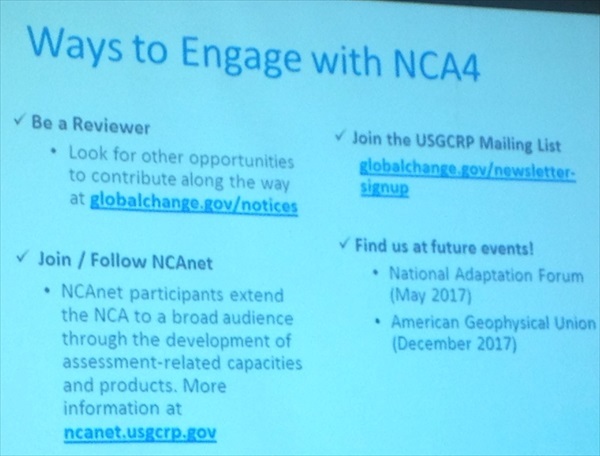 Check out what’s new in regards to the layout and chapter sections: http://www.globalchange.gov/content/whats-new-nca4 He also explained that the document ends with a chapter on responses which focuses on near-term adaptation needs and increased resiliency & mitigation of avoiding and reducing long-term risks. He pointed out that these sections are meant to be policy relevant but not prescriptive in nature. We then dove into the engagement component of the Town Hall where the audience members asked the authors some clarifying questions, requested explanations, and advised them to clarify the differences between the Hawaiian Islands and the U.S. Affiliated Pacific Islands. New chapters were added this go around, thanks to public comments addressing air quality, international effects which is relevant to the U.S. 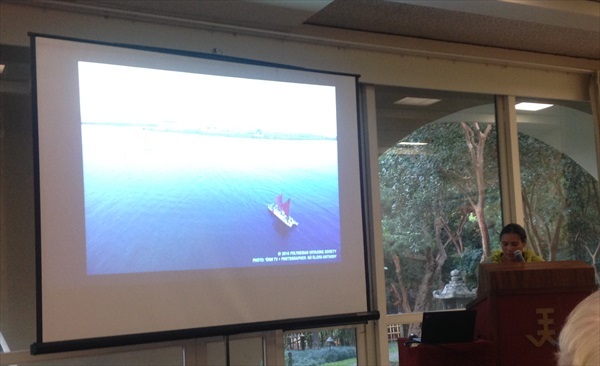 Affiliated Pacific Islands & the interplay of impacts across sectors and compounding stressors. That sparked a lot of questions in regards to El Niño’s, Tornados, and other extreme weather events and trends we are seeing and have seen since the last publication. 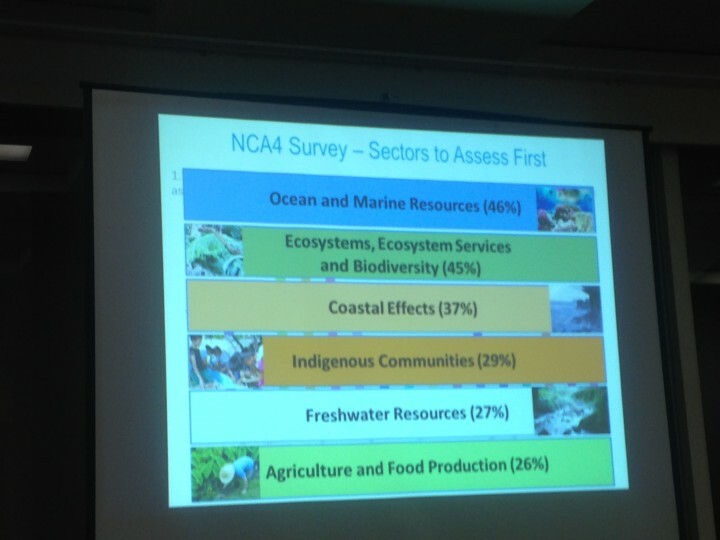 When they announced the sectors they will focus on in our chapter, concerned citizens asked why agriculture, energy, and fire risks were not more prominent. The authors explained the lack of agriculture data; however the Pacific Islands Agroforestry Adaptation Initiative of CTAHR & PICCC was mentioned as trying to address some of these gaps. We were reminded that many of these topics are mentioned in the national sector chapters and the authors intend to weave relevant case studies from different regions as well. So if you can share concrete examples, the authors welcome your help. However, there was one theme that really stood out and received thoughtful responses from a variety of authors. The theme was around funding and who is going to pay for these changes? The hair on the back of my neck stood up, when a gentleman from Guam reminded us all that if you think it is going to be hard in Hawaii, the islands of the W. Pacific will need significantly more help as their issues will obviously be different. It was the author’s expressions and heads turning to see who would comment on some of these tough questions that made me realize how close to home this will impact all of us. However, it was refreshing when one of the experts reminded the audience that we are lucky to live in a state that is on board with climate change. Emphasizing the power in communities and that we should continue to exercise our voices no matter how far across the ocean we are from D.C. Those words of hope and encouragement to stay involved left an impression on me. As I looked around the room, I was thankful to be on this canoe journey that Kalisi spoke of and enamored by the wealth of knowledge that surrounds these islands.